Female officers trained in Turkey attend a graduation ceremony in Antalya. Some 75 female Afghan commissioned officers successfully completed a military training program in Turkey Friday. The officers received their certificates in a graduation ceremony at the Third Infantry Training Brigade in Turkey's southern Antalya province. The Afghan officers were given a nine-week training program on personnel management, human resources, finance, and logistics. Speaking at the ceremony, Muhammad Ashiq Gharib, a security adviser to the High Peace Council - an Afghan body involved in the country's peace efforts - thanked the Turkish Armed Forces (TSK) for the education program. "The Turkish Armed Forces has been giving great support to our army. We have sent female commissioned officers [to Turkey] because we have full confidence in Turkey," Gharib said. Lt. Fatima Sadat, one of the graduates, said the training program had made substantial contributions to their professional development. 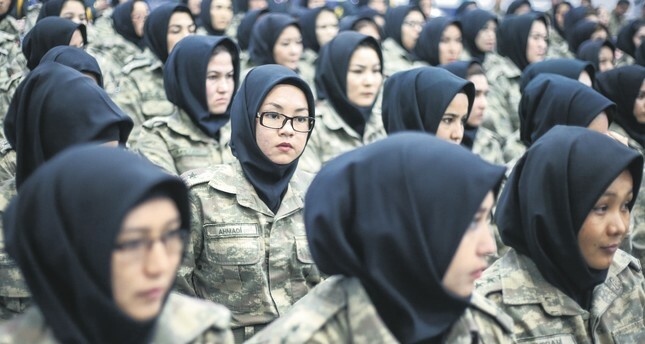 Turkey previously trained female Afghan police cadets in 2016. Since 2011, more than 2,600 Afghan policemen and women have been trained by the Turkish police academy. Although they are nearly 3,000 kilometers apart, Afghanistan and Turkey enjoy close ties dating back to the early years of the Republic of Turkey. Turkey was the first country to open a diplomatic mission in Kabul in 1921 and both Muslim-majority countries maintain deep cultural ties dating back to the Turkic rule of Afghanistan up to the 12th century.